Funky Seventies Video Slot Guide & Review - Casino Answers! The Funky Seventies is a 5-reel, 4-row, 40-line video slot developed by Net Entertainment, featuring stacked wild symbols, scatter wins, multipliers and a free spins feature. You can play the Funky Seventies video slot at Tower Gaming Casino and Casino Euro. If you still think that Saturday Night Fever, pet rocks and lava lamps are fab, then you’ve got a craving for the 1970’s. The Funky Seventies brings many of the great things people are nostalgic about from the 40 years ago and converts it to video slot form. The first thing you’ll notice on The Funky Seventies is the never-ending disco loop that plays at all times while you’re playing the slot game. Other things you’ll notice are the symbols. There’s the 70’s Wild symbol, Scattered Girl with an Afro symbol, Dodge Charger, Computer, Disco Ball, See-O-Matic, Cassette Tape and Ace, King, Queen and Jack symbols. For the skinny on the Funky 70’s slot game from Net Ent, a screenshot is below. Coin values on the Funky Seventies slot machine are $0.01, $0.02, $0.05, $0.10, $0.20 and $0.50. You can play 1-40 paylines at 1-5 coins (or bet levels). You can bet as little as a penny on a spin on The Funky Seventies up to the maximum total bet of $100. You can manually skill stop the reels during a spin by hitting the Spin button in mid-spin. To play the Funky Seventies slot game at the highest bet level with all 40 lines selected, hit the “Bet Max” button. For all other bets, select your bet and hit the “Spin” button. 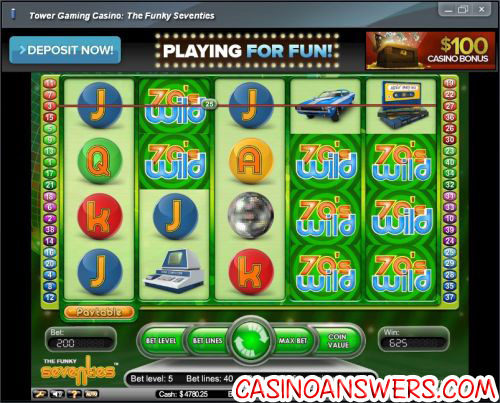 The 70’s Wild symbol is the highest paying symbol on the Funky Seventies online slot game. 5 70’s Wild symbols on a selected payline will pay out the 1000 coin top jackpot. The 70’s Wild symbol is a stacked wild symbol, which not only means that it will substitute for all other symbols in the game (except for scatters), but also multiple wild symbols can show up on each reel to create many more possible winning combinations. The 70’s Girl is scattered on the Funky Seventies video slot. 3 of these 70’s Girl symbols will not only pay 2X your total bet, but also will win you 5 free spins with a 2X multiplier. During the free spins feature, 3 more Scattered 70’s Girl symbols will still pay 2X your total bet and re-trigger the free spins feature. You can celebrate the good times by winning big on the free spins feature when you play the Funky Seventies at Tower Gaming Casino! Winning combinations and payouts are made according to the Paytable. Payline wins are multiplied by the bet per payline. Wild symbol substitutes for all symbols except scatter symbols. Multiple wild symbols on each reel line up to create stacked wilds. Scatter wins are paid independent of bet lines selected. Only the highest win per active payline will be paid out. Payline wins pay if in succession from leftmost to right. Simultaneous wins on different paylines are added. For the majority of the payout schedule, a screenshot of the Funky Seventies Paytable is below. The Funky Seventies has an autoplay mode that can be opened up by hitting the “Auto” button. You can play 10, 25, 50, 75, 100, 250, 500, 750 or 1000 autoplay spins at a time. In the advanced settings, you can set the Funky Seventies autoplay mode to stop on any win, if free spins is triggered, if the jackpot is won, if a single win exceeds (any amount you input) and if cash increases/decreases by (any amount you input). You can stop the autoplay mode at anytime on the Funky Seventies video slot. If you still dig the 1970’s, you will want to veg out and play the Funky Seventies video slot. It may not have the best special features, but the stacked wilds can get you some jing fo’ sho. You can play the Funky Seventies video slot when you sign up and make a deposit at Tower Gaming Casino! Where can I play a Funky 70’s Flash game for free? You can play a Flash game of the Funky 70’s online slot game for free or for real money at Tower Gaming Flash Casino and Casino Euro. 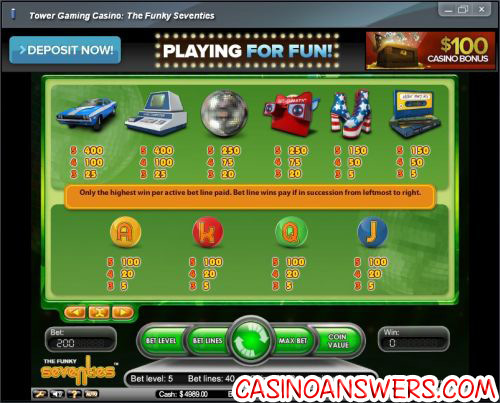 If you experience problems with the Instant Play casino software, try downloading the latest version of Adobe Flash Player. If I’m in the USA, can I still play the Funky 70’s for real money? Unfortunately, players from the United States are out of luck when it comes to playing this game for real money. You can still play all the great classic slots, video slots and interactive slots at the USA-friendly Slots Jackpot Casino! What’s the best way for Macintosh users to play The Funky Seventies? Macintosh users can either use the Flash casino at Tower Gaming Flash Casino and Casino Euro or there is a Macintosh casino they can download at Tower Gaming Casino. For more information on Tower Gaming Casino, please read our Tower Review. Where else can I play the Funky 70s video slot? If you are looking for another casino besides Tower or Casino Euro to play at, you can read our Betsson Casino Review for an alternative.